Our licensed technicians are known for their high standards, superior quality workmanship and attention to detail. In addition, our technicians have all the necessary factory training, they attend seminars and training sessions to stay on top of the latest developments in the automotive body repair industry. Our Car-a-Liner frame bench measuring system precisely reshapes the structural components, returning dimensions to the same as the original. Even areas that cannot be seen by the naked eye are restored to as good as new. Everything is pulled back into it's original shape; from how the doors close to how tires ride the pavement. To insure final suspension alignment adjustments are made in our in-house service department to match factory specifications. 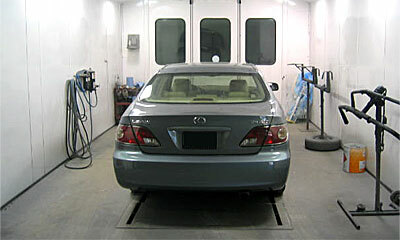 Our State of the art down draft painting facilities insure your vehicle is painted in a clean, filtered air environment. This provides virtually a dirt free finish. Once the finish is applied, we bake the entire vehicle to thoroughly dry and harden the finish comparable to your manufacturer's procedures. Our specialized base coat / clear coat system matches your car's look by combining primer, colour and top coat to give you a finish as good and as long lasting as your manufacturer's finish. Our paint suppliers design all their products to work together to achieve the ultimate finish.